If Sergio Leone and Alexandro Jodorowsky teamed up to make a crime movie and enlisted Russ Meyer to edit it, it would look something like Let the Corpses Tan. This one is the latest out-there genre outing from Belgian auteurs Hélène Cattet and Bruno Forzani, the folks behind the much-acclaimed giallo salutes Amer and The Strange Color of Your Body’s Tears. 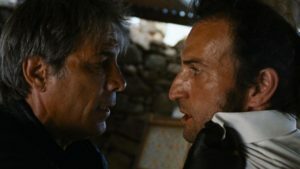 Although the film is a crime story, it often feels like a western with its sun-soaked backgrounds, rocky landscapes, Leone-esque too-close-for-comfort close-ups and Ennio Morricone music cues. The story, presented in arty but sometimes frustratingly fragmented fashion, tells of a group of crooks led by the brutish Rhino (Stephane Ferrara, Alexander) who recently stole a fortune in gold bullion and then land on a beautiful but desolate Mediterranean mountaintop occupied by a pleasure-addicted painter (Elina Lowensohn, Schindler’s List) and a burned-out writer (Marc Barbe, Gauguin: Voyage to Tahiti). The tension is ratcheted up when the writer’s estranged wife (Dorylia Calmel, Homecoming), nanny (model Marine Sainsily) and child arrive, followed by two police officers in pursuit of the robbers. The situation calls for double-crosses, odd interactions and allegiances between characters and, in the filmmaker’s world, a whole lot of fetishistic dallying. Cattet and Forzani show off their penchant for torturous episodes, ultra-violence, lactating breasts and meat (!?) with a horrific/beautiful aesthetic that is lovely and difficult to watch at the same time. Based on a revered 1971 French noir novel, the film puts the logic and plot complications —of which there are many—on the backburner, in favor of the parade of lurid images, set to eclectic cutting and a jarring soundtrack. The DVD and Blu-ray release includes commentary by film critic Alexandra Heller-Nicholas, veteran of several cult digital releases, and Queensland film Festival co-director John Edmond, who show off their admiration for Cattet and Forzani’s directors’ work, pointing out their artistic and cinematic inspirations in an easygoing, often illuminating conversation about a not-so easygoing movie.